This cellML model is known to run in OpenCell, JSIM and COR to recreate the published results. The units have been checked in COR and they are consistent in as much as they are known to be equivalent. This particular version of the CellML model represents fast twitch muscle. Schematic diagram of the muscle membrane electrophysiological model. There are descriptions of K+, Cl- and Na+ transport in the sarcolemma and t-tubules membranes. The model includes descriptions of an inward rectifier K+ current (IIR), a delayed rectifier K+ current (IDR), a Na+ current (INa), a Na+/K+ pump (INaK) and a Cl- current (ICl). 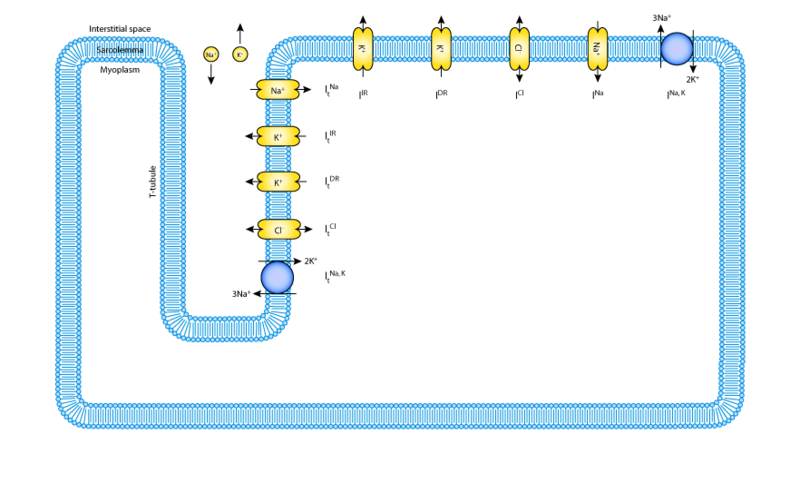 Currents in the t-tubules are denoted by a subscript t.
Schematic diagram of the Ca2+ dynamics model. 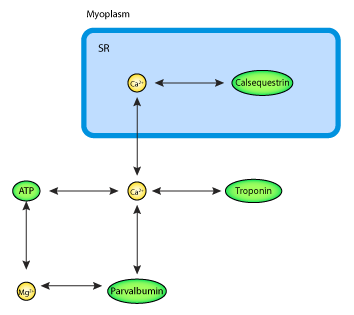 Ca2+ binds to parvalbumin and ATP myoplasmic buffers, is transported and buffered to calsequestrin in the SR and bind to tropinin to generate force. Schematic diagram of the crossbridge dynamics model. Two Ca2+ ions must bind to the troponin-tropomyosin regulatory unit (RU) to permit crossbridge cycling (XB) kinetics. Open circles denote Ca2+ binding sites, the black circles represent the number of Ca2+ ions bound to troponin and the black bar represents the tropomyosin block. 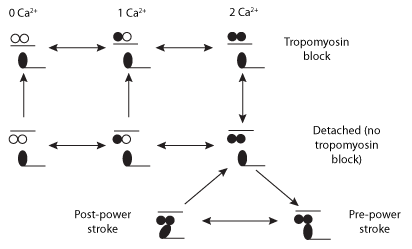 Schematic diagram of the phosphate dynamics model. 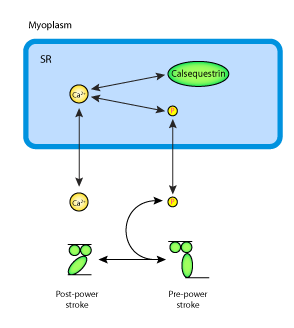 Phosphate is generated during crossbridge cycling and SR Ca2+ pumping, feeds back to slow crossbridge cycling and is transported into the SR to precipitate with Ca2+ and reduce Ca2+ release from the SR. Derived from workspace Shorten, Ocallaghan, Davidson, Soboleva, 2007 at changeset 33944b1d8ee3.